Video: Watch a short film about Ndala here. Overview: In October 2013 building work started on a small piece of land in the village of Ndala in the district of Shinyanga. The project was to provide classrooms, an office, a kitchen and two sanitation block for a community based childcare centre, specialising in providing pre-school education for local 3 – 6 year olds. Funded entirely by Lara’s Foundation, the project was run in partnership with the small Shinyanga branch of Save the Children and Raleigh International. In November 2013 the Early Development Centre ( ECD) in Ndala was completed and within a month children were attending the centre. For the first time the pre-school children of the village were able to enjoy the comfort of the beautiful new building. The Early Childhood Development (ECD) centre provides this facility to some of the most marginalised children in the suburb of Ndala. A large proportion of them are vulnerable children affected by HIV/AIDs, cared for by guardians in the community. “The district of Shinyanga is one of the least developed of Tanzanian regions and as such it is characterised by the high prevalence of mistreatment of children, low school enrolment rates and low literacy rates amongst adults. Despite large diamond and gold mines, the area’s infrastructure remains undeveloped and it has a low per capita income compared to other Tanzanian regions.” Augustino Mwashiga, Save the Children programme manager. The centre sits within the heart of the community. It is a social institution run by community members, who manage all fundraising and resources for the centre. Building the centre has provided employment opportunities for local fundi (workmen) and on a longer term, provides employment for teachers and cooks. The ECD also provides respite to guardians of the children attending, allowing time for them to work whilst the children are at the centre, and providing a hot meal for each child attending. “Lara’s Foundation is proud and happy to have played a part in the provision of this ECD. Our funding of the centre has been made possible by the outstanding fundraising efforts of Lara’s family and friends. We owe our commitment to continue our efforts, to Lara. She is our eternal source of energy and inspiration. She is the reason we funded this centre. We hope that it will provide the necessary education to the children of Ndala to enable them to progress to further education without disadvantage”. Carolyn, Trustee and Founder of Lara’s Foundation. Thank you very much. We appreciate what Lara’s Foundation, Save the Children and Raleigh International have done for us. We face many challenges when it comes to education, especially in early childhood development. We can now take a step ahead into providing better futures for our children through education. So we thank you, all the organisations, our donors and all the volunteers who have contributed from the start until today. You are most welcome here in Ndala.” Dixon, the Village Executive Officer in Ndala. See some more text and images taken from Raleigh International’s blog. 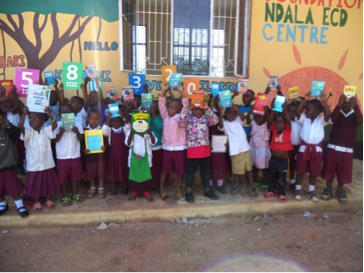 In October 2014 after many months of research we were able to find a company who produced pre-school books which were appropriate for the children of Ndala and these were sent to the Early Childhood Development Centre. Titles included ABC Reading Book and the Kiswahili equivalent, Alfabeti za Kiswahili. Delivery to the ECD was made by the kind people of the bookshop in Dar Es Salaam who jumped on a bus for the 200 mile road trip to Ndala! Ndala ECD centre provided an opportunity to children 3 – 6 years to develop their social, cognitive skills in an environment which enables them to explore, discover and interact with their world. Children experience meaningful play in a warm setting. Ndala ECD encourages creativity and curiosity, as the children develop and master developmental goals and objectives. The centre was built in 2013 with funding from Lara’s Foundation. The building has the capacity to accommodate 50 children, a safe space for children to play and socialise. Currently, there are 49 children enrolled in Ndala ECD (22 females and 27 males).The community is happy to have the ECD and they bring their children to study at the ECD because it a safe place for their children to study and play. Children are assessed in their development – socially, emotionally, cognitively and physically. Each child is unique in their growth. Ndala ECD staffs cater the lessons and experiences based upon the individual child. The center believes in the vital role of partnering with the parents to draw them into their child’s overall development. Parents are offered the opportunities to attend Parent/Teacher Conferences as well as have daily communication about their child with the teacher. When an area of concern arises referrals are made to outside resources for the family, and the classroom staff creates experiences within the classroom to address the targeted needs. As for the children from Ndala ECD , say that they like going to school because they play, sing and learn their A,B,Cs and number they also like the food provided at the centre. Parents are happy to bring their children at the center to study because they believe that it a safe place where their children learn basic skills in reading, counting and numbers. They see a lot of Physical health, cognition, language, social and emotional development in their children as they attend ECD classes. 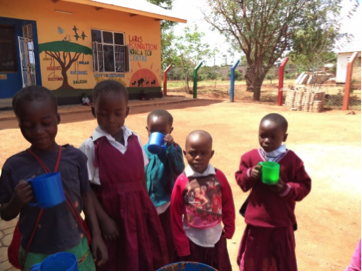 Due to this most parents are willing to support Ndala ECD centre with food for their children and ECD caretakers’ allowances. 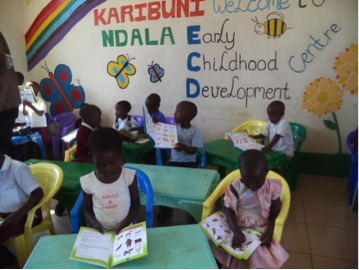 Parents and community surrounding Ndala ECD centre are eager to have more centers like this so as to prepare their children for school, social interaction, build their nutritional status and develop their well – being.